Always attention to detail, technical skills, passion in our work and great attention to customer needs are the strengths that have allowed us to excel in the field of sale of ALCLAD II ALC712 CANDY VIOLET 30 ml. Consultando il catalogo di Aerografando you will immediately notice how vast it is and how diversified the model range is Candy, you will find the best ALCLAD II ALC712 CANDY VIOLET 30 ml offers at the best prices on all ALCLAD II ALC712 CANDY VIOLET 30 ml of the brands Alclad 2 Lacquers. 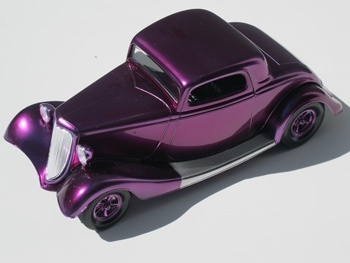 ALCLAD II laquers produces a wide range of realistic and durable metal finishes for model airplanes, cars, trucks, figurines and armor. Thanks to a variety of uses, products ALCLAD II are considered among the best finishing products for plastic kits and polycarbonate / lexan bodywork. Shake well before use. Do not dilute. The surface must be completely clean. Apply a medium layer at a pressure of 20-30PSI of plastic raw clean. Drying time of about 15-30 minutes. As soon as the solvent evaporates, increases the gloss. Wait an hour before using the colors ALCLAD CANDY. Avoid use in excessively humid areas. Read the reviews of our customers on ALCLAD II ALC712 CANDY VIOLET 30 ml of the category Candy. With us you will find only satisfied customers, thanks to a technical assistance made by those who really know the world Candy. Review ALCLAD II ALC712 CANDY VIOLET 30 ml of the brand Alclad 2 Lacquers. Trust in the quality and professionalism of Aerografando on the sale of ALCLAD II ALC712 CANDY VIOLET 30 ml, only from us you will find the best prices. You want to have more details on ALCLAD II ALC712 CANDY VIOLET 30 ml ALC712 or more generally on ours Candy? You are looking for a Candy but do not you find it in the catalog? Staff of Aerografando will answer all your requests.